Happiest of happy birthdays, Charles Dickens! You've brought so much pleasure to so many souls since the day you first picked up a pen. And how much joy you've yet to bring to future generations. At least let's hope you'll always have readers, since your prose could hardly be reduced to 140 character Tweets. Or they could but it would take a generation getting through one novel. One sentence could take multiple Tweets. "I have heard it broached that orders should be given in great new ships by electric telegraph. I admire machinery as much as any man, and am as thankful to it as any man can be for what it does for us. But, it will never be a substitute for the face of a man, with his soul in it, encouraging another man to be brave and true. Never try it for that. It will break down like a straw." Remarkable how prescient this quote is. Imagine what he'd say about us now. Dickens' works were first published serially, at a time people were resigned to waiting for things. 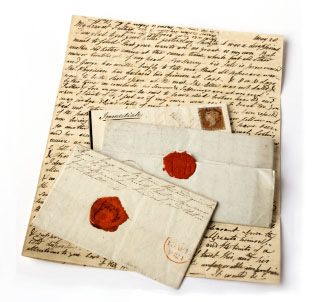 The quickest method of communication was via the aforementioned telegraph but everyday events were transmitted by letter. Handwritten letter, I mean. If you lived in a city it was possible to have a short postal dialogue in the space of a day. How their heads would whirl seeing us communicate around the world via a few keystrokes, sharing not just words but photos, videos, sound bytes… It would be as incredible to them as looking back a generation makes people around my age feel. Mine is the last generation capable of remembering a time before technology ruled, the last with a "writer's bump" on our right middle fingers from holding a pencil. The world's changed so much in the 200 years since Charles Dickens was born and lived. 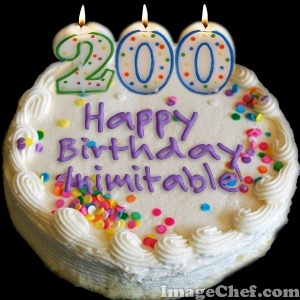 By the time he's 400, which writers alive today will be as celebrated at their bicentennial? Hard to say, considering how few authors' birthdays we mark now. What does this say about us, about literature and its importance? I think I'll leave that question hanging. I'm not sure I want the answer. 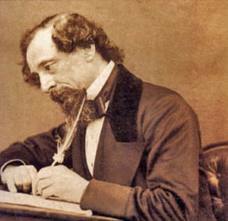 In the meantime, Happy Birthday, Charles Dickens. I will immediately clutch your rss as I can not to find your email subscription hyperlink or newsletter service. Do you have any? Kindly let me understand in order that I could subscribe. Thanks. How appropriate. 🙂 I’m re-reading Great Expectations in anticipation of the BBC airing in the US in April. Can’t wait! It’s almost like you have to be a dead writer before we celebrate your birthday. I mean… a really, really good dead writer.